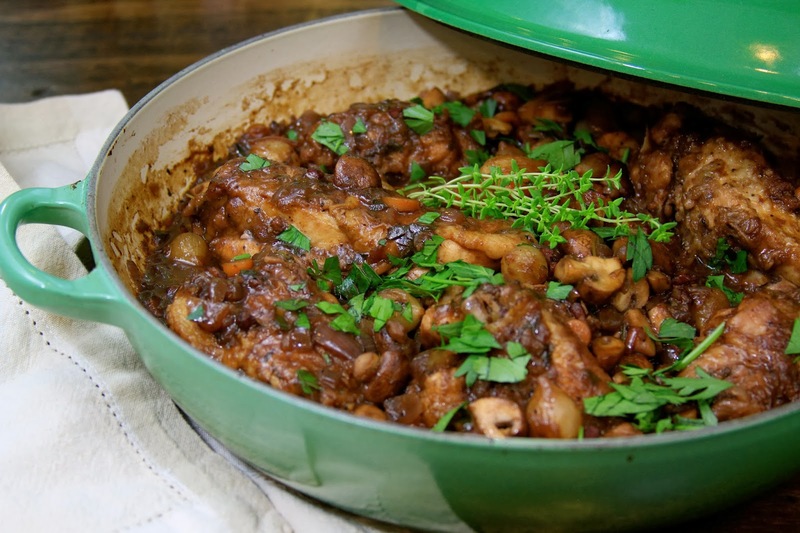 The first time I ever had Coq au Vin was during the summer semester before my senior year in college. One of my favorite professors, who was also a gourmet cook, made this dish and shared it with me and forever changed the way I thought about food. I remember biting into a beautifully browned mushroom bursting with red wine and feeling that I was eating my first adult meal. I also remember wondering if it was ok for me to eat it since I wasn’t yet 21 (I was both very sheltered and very, very square in college)! I remember how special I felt after that first bite–that my professor had thought to share such a lovingly prepared, and to my inexperienced palate, decadent, dish with me! Now I realize that the dish itself is not so much decadent, as it is classic French, rustic, country food, but was every bit lovingly made and incredibly delicious. To this day, this is how I love to cook and why I celebrate the Autumn season with rustic, homey, braised dishes. For me, cooking this way shows love. 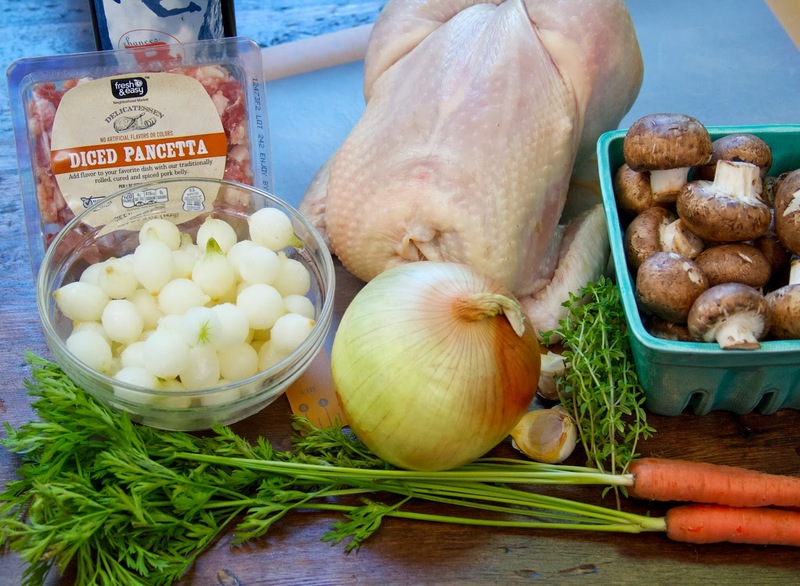 Every component gets special treatment as it goes into the pan and the result is a rich mélange of juicy chicken, robust wine and tender vegetables. It’s a perfect dish to make when you want to show someone that you really care! This recipe was adapted from one of my new favorite cookbooks: All About Braising, by Molly Stevens. This is one of the longer recipes that I’ve posted and it may seem like a lot of different steps, but don’t be daunted. None of these ingredients are exotic or expensive and once you have everything chopped and in place, it goes rather quickly. 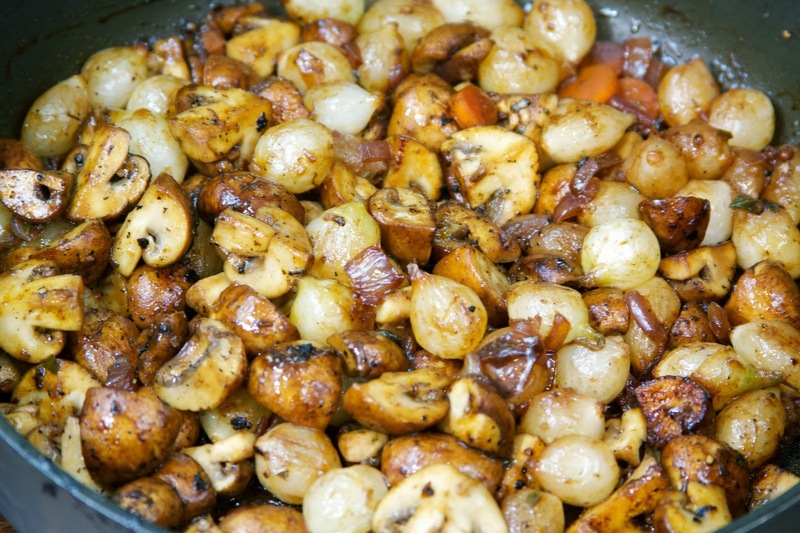 The mushroom and onion garnish can be made while the chicken is braising. The best cooking vessel to use for this dish is a large, heavy bottomed Dutch oven or braiser with a well-fitting lid that can be transferred from the stovetop to the oven. I used a 5 quart braising pan. 1. Cook the diced pancetta or bacon until the fat renders and the meat is crisp on the outside but still tender on the inside. Transfer the bacon to a plate lined with a paper towel and set aside. Remove the pan with the drippings from the heat. 2. Season the chicken pieces generously with salt and pepper. Dredge the chicken in the flour and shake off the excess. Add a tablespoon of butter to the pan with the drippings and place over medium-high heat. Add half of the chicken to the pan and brown, being careful not to crowd the pan. As each piece browns, set aside on a plate. Add additional butter to the pan and finish browning the remainder of the chicken pieces. You may need to turn down the heat at this point so that the second batch of chicken does not burn. 3. After all of the chicken has browned, pour off the excess fat in the pan, but do not discard the browned bits of chicken (this is called “fond”). Add another tablespoon of butter and after the butter melts, add the onion and carrot and sauté until the onion softens (about 5 minutes). Add the tomato paste and stir to completely coat the vegetables. Add the 2 tablespoons of Cognac and increase the heat to deglaze the pan, which means that the liquid will now loosen all those roasted bits from the bottom of the pan. Ok, full disclosure: I used about 4 tablespoons of Cognac, just because it’s delicious and 2 tablespoons just didn’t seem to do it justice! 4. 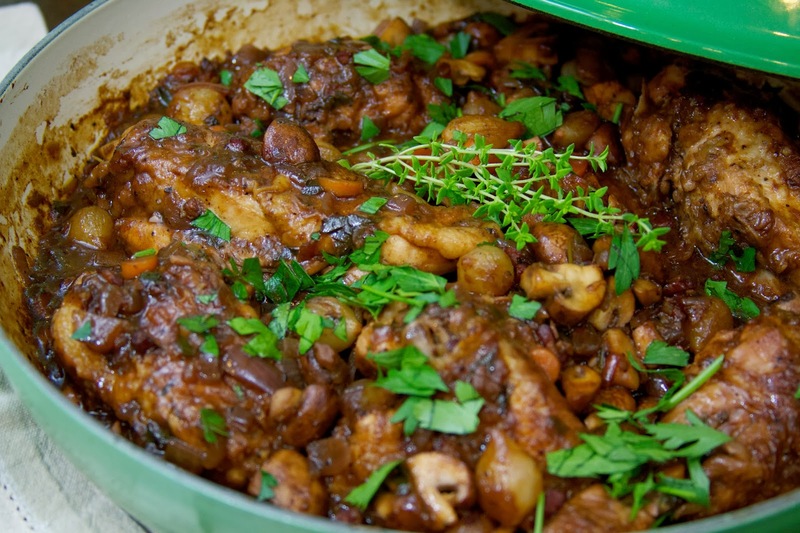 Raise the temperature to high and add the entire bottle of wine, the garlic, thyme, bay leaf, parsley. Bring this mixture to a boil and reduce the liquid by about half. Stir in the reserved pancetta and 1 cup of chicken stock and bring to a boil. Remove and reserve 1/2 cup of this mixture for the garnish which will be made later. The chicken is added to the braising liquid. Place the chicken breasts on top of the other pieces to cook more slowly. 5. Add the chicken back to the pan and tuck into the braising liquid. If you have used breast meat, place the breast meat skin side down on top of the other chicken pieces. This will allow the breast meat to cook more slowly and keep it from drying out. Cover the pan with the lid and place into the 325 degree oven. After about 15 minutes, turn the breast pieces over (skin side up) but keep it on top of the other chicken pieces. Continue braising for 30 to 45 minutes more, or until the chicken is tender and pulling away from the bone. 6. Clean and dry the mushrooms and cut into quarters. In a frying pan (I used a non-stick pan for this part) melt 1 tablespoon of butter and add the frozen pearl onions. Toss the onions in the butter and stir or toss until they begin to brown. Add the reserved 1/2 cup of braising liquid and season with a pinch of salt and pepper. Place a lid over the onions and cook for about 4 minutes. Remove the onions from the pan and set aside in a small bowl. 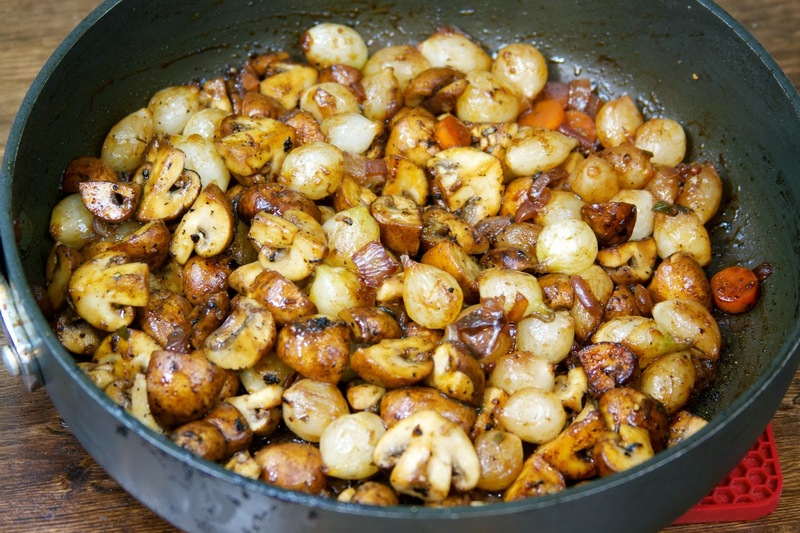 Add one more tablespoon of butter to the pan and sear the mushrooms until they are a nice, golden brown color. Add the onions back to the pan and set aside. 7. 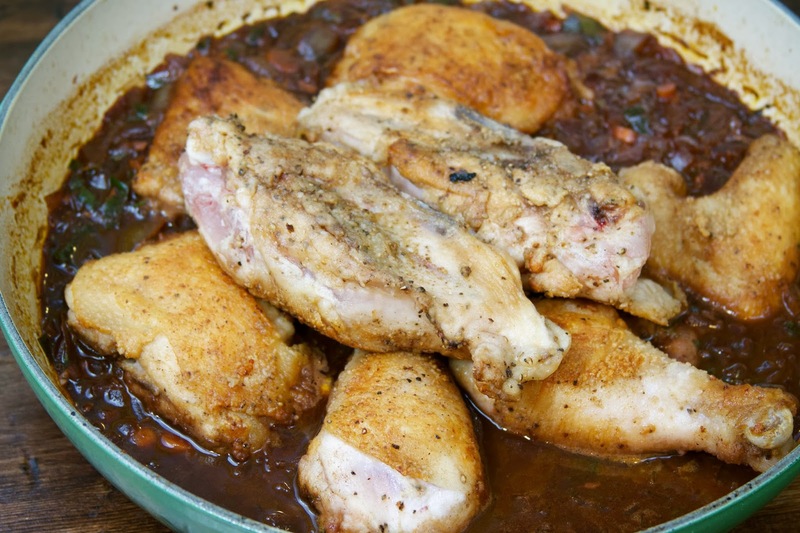 After the chicken is done braising, remove the chicken pieces from the pan and set aside. Skim as some of the fat from the surface of the braising liquid. Place the pan on the stove over high heat and reduce the braising liquid until it reduces just a bit–maybe by a quarter. Add the mushroom and onion mixture to the braising liquid and heat through. 8. Pour the mushroom and onions and sauce over the chicken pieces, sprinkle with the chopped parsley and serve. I served this on top of roasted fingerling potatoes, but mashed potatoes or noodles would also be great! Previous PostSay Hello to My Little Friend//This Means War!